After several full days of dining out, my body has been craving vegetables like no other! 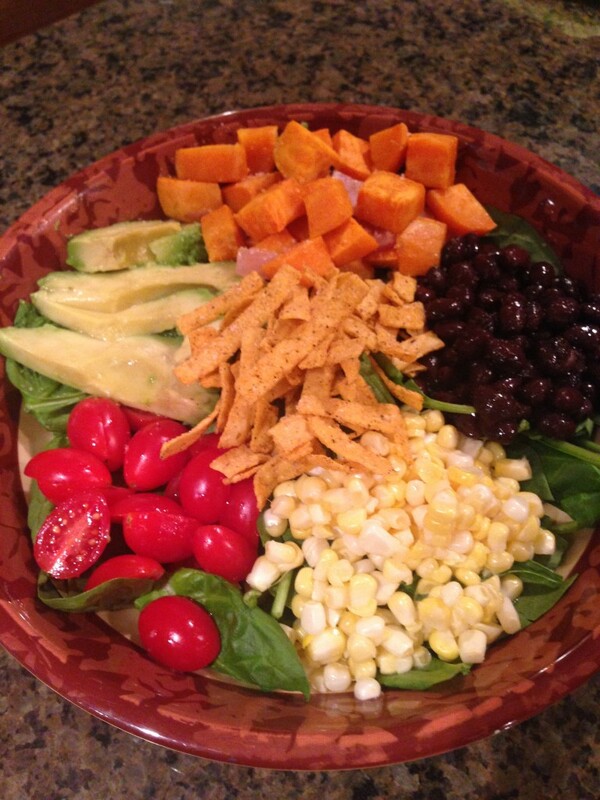 For dinner last night, I created a southwest salad that is full of health benefits. Spinach: rich in antioxidants and is a good source of vitamins A, B2, C and K and also contains magnesium, manganese, folate, iron, calcium and potassium. It has lots of heart-healthy benefits, is good for gastrointestinal health, and has anti-inflammatory properties. Sweet Potatoes: high in vitamin B6 which can help prevent heart attacks, a good source of vitamin C, contain vitamin D which is good for immune systems, contain iron, and are a good source of magnesium which is the anti-stress mineral. Avocado: contain vitamin B6 and folic acid which help decrease risk of heart disease, lower cholesterol levels, control blood pressure, and has anti-inflammatory properties. Tomatoes: good source of vitamins A, C, K, folate, and potassium, contain beta-carotene which helps protect skin against sun damage, and can help regulate blood sugar. Black Beans: protein and fiber have digestive tract benefits, can help lower blood cholesterol levels, and regulate blood sugar. 1. Preheat oven to 400 degrees F. Place the chopped sweet potatoes on a large baking sheet lined with foil. Drizzle with olive oil and salt. Roast sweet potatoes for about 40 minutes, tossing half way through. 2. Place spinach in a bowl. 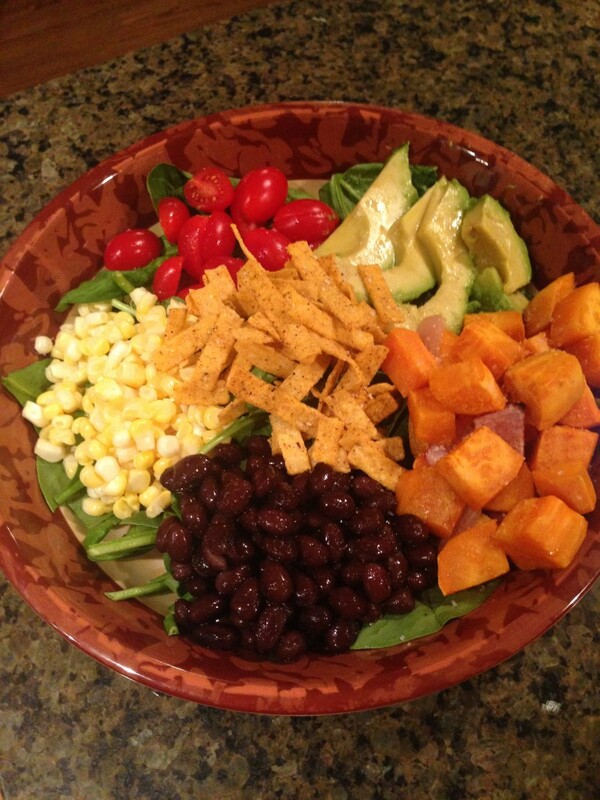 Top spinach with roasted sweet potatoes, black beans, tomatoes, corn, avocado, and tortilla strips. Serve with dressing of choice. 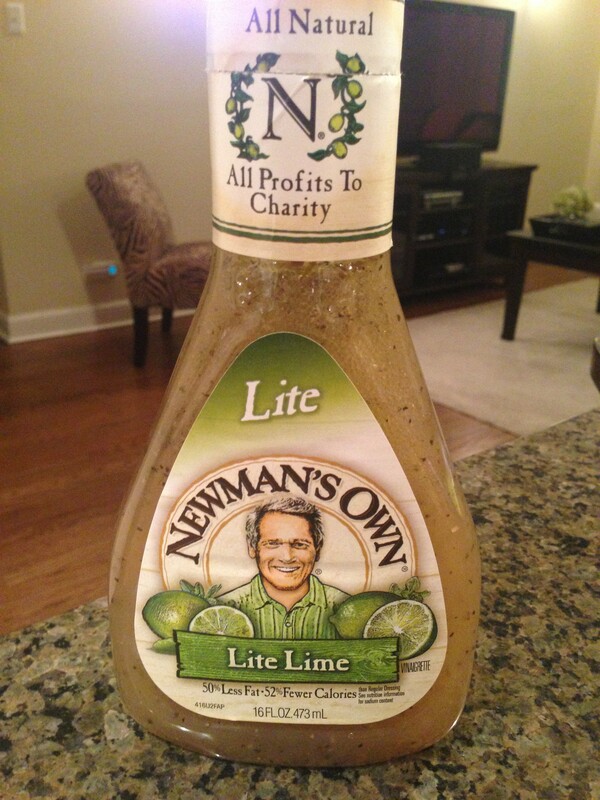 I used Newman’s Own Lite Lime. Hope you enjoy this salad as much as we did! Linking up with Jenn today for another WIAW.